This the fourth post in a series about our Disney Cruise on the Wonder in October 2014. To check out the other posts in this series, click here. 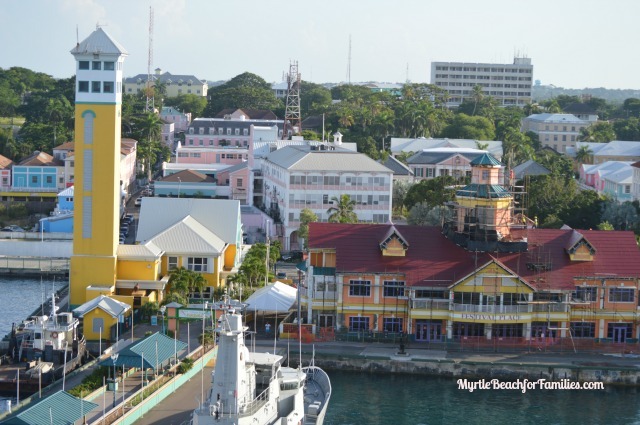 On day one of our cruise on the Disney Wonder, we made a stop in Nassau, Bahamas. We had been one time before on another cruise 19 years ago and, at that time, it wasn’t very impressive. I was kind of looking forward to staying on the boat during this stop to capitalize on fewer people on the decks and at the pool. My husband, on the other hand, wanted to walk around. Since we’re not likely to visit Nassau again any time soon, I agreed, so off we went. Three steps off the ship we were bombarded with solicitations for a horse-drawn carriage ride, a cab ride, and other tours. We tried to look like we were in deep conversation as to hopefully dissuade those thinking of approaching us, but no such luck. I can’t say that anyone was rude, but it made me uncomfortable. We scurried along to do some browsing. This area was well known for some beautiful, upscale brands that I wanted to have a look at. Unfortunately, in front of so many shops there were people strongly encouraging you to enter. You may think I’m totally nuts, but I couldn’t have been more put off. I hate to use the word “lure” but if I could think of something just a tad milder, I would use that word. We spend about 30 minutes off the ship and headed right back on. If we were to return to Nassau I would do it differently. 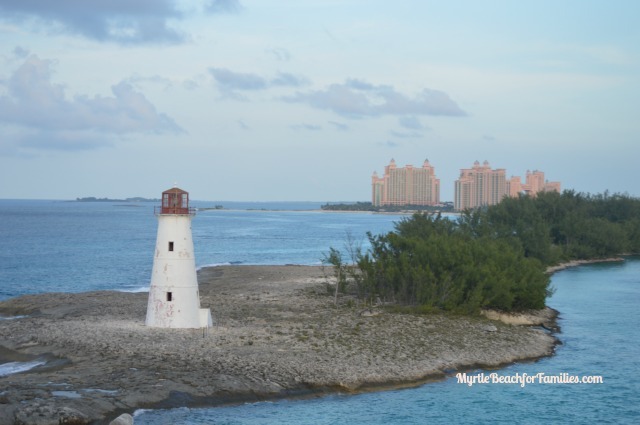 I was reluctant to plan a day at the beautiful Atlantis resort since we live at the beach and have exposure to all of its wonderfulness as often as we’d like. I couldn’t see spending the money, but everyone we know who visited the resort had a great time.The other option would be to spend the day on the boat, which we ended up doing. One of my favorite memories was camping out on a top deck and watching Monsters, Inc. on the big screen over one of the pools. We had drinks and lunch and more drinks. It was fantastic! That night we went to a martini tasting class and had a great time! It was reasonably priced ($15 per person), we learned a lot and had entirely too much to drink. Immediately following we ate dinner at Triton’s and had a lovely evening. Funny side note, we were seated at a table for four with another kid-free couple. Our first night together was filled with awkward conversation. They seemed uncomfortable. On this night we were, admittedly, more chatty. I thought we had a nice time at dinner but this was the last time we saw them for dinner! They never joined us again! While I’ve mentioned drinking a few times, I swear no one is a lush, nor was anyone’s behavior belligerent, or even obnoxious. Hopefully we didn’t somehow offend them. They told us how they were going to a whiskey tasting the next day, so I don’t think they were against alcohol. Oh well…we’ll never know.